Product prices and availability are accurate as of 2019-04-19 21:32:57 EDT and are subject to change. Any price and availability information displayed on http://www.amazon.com/ at the time of purchase will apply to the purchase of this product. We are happy to offer the excellent Certified Safety K616-061 18PR Class A Complete First Aid Kit, ANSI Z308.1-2015, Plastic Case, Red. With so many available today, it is good to have a name you can trust. 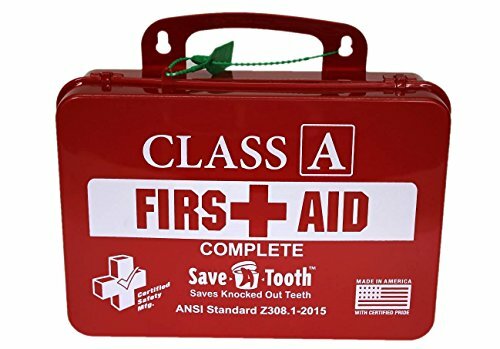 The Certified Safety K616-061 18PR Class A Complete First Aid Kit, ANSI Z308.1-2015, Plastic Case, Red is certainly that and will be a great acquisition. 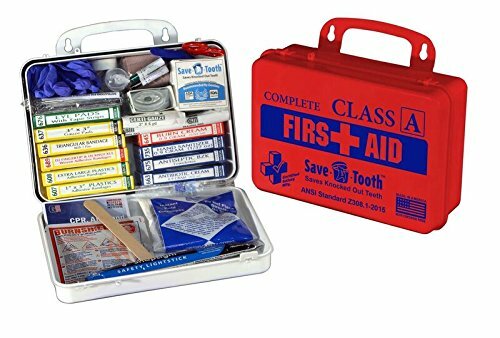 For this reduced price, the Certified Safety K616-061 18PR Class A Complete First Aid Kit, ANSI Z308.1-2015, Plastic Case, Red is widely recommended and is a regular choice with lots of people. Certified Safety MFG have included some excellent touches and this means good value for money. Certified Safety's K615-061 Class A Complete First Aid Kit is designed for the most common types of workplace injuries and is fully compliant with ANSI Standard Z308.1-2015. Portable case which can also be wall mounted. Made in the U.S.A. Kit contents: 1" x 3" Plastic Certi-Strips (16/unit), 2" x 3" Extra Large Plastic Certi-Strips (6/unit), Finger Tip and Knuckle Certi-Strips (9/unit), Triangular Bandage with Pins (3/unit), 3" x 3" Certi-Gauze Pads (4/unit), Certi-Sporyn Antibiotic Cream (10/unit), 5" x 7" Antiseptic BZK Towelettes (10/unit), Hand Sanitizer (10/unit), Certi-Tape Eye Pads (8/unit), Certi-Burn Cream (10/unit), 1/2" x 2-1/2 yd Certi-Tape (1), Size Large Powder Free Nitrile Gloves (1 pair), CPRotector (1), 4" x 4" Burn Dressing (1), 5" x 7" Certi-Cool Junior Cold Pack (1), 1 oz Eye Wash (1), Rescue Blanket (1), 2" x 6 yd Certi-Gauze Roll (1), 4" Bandage Scissors (1), 4" Plastic Forceps (1), Non-Sterile Tongue Blade (1), 5" x 9" Compress Trauma Pad (1), Diphen Tablet (1 pkg), Green Glow Stick (1), 2" x 5 yd Ace Style Elastic Bandage (1), Save-A-Tooth Preserving System (1), WoundSeal (Applicator, Pour Pack, Teardrop), and a First Aid Facts Guide.